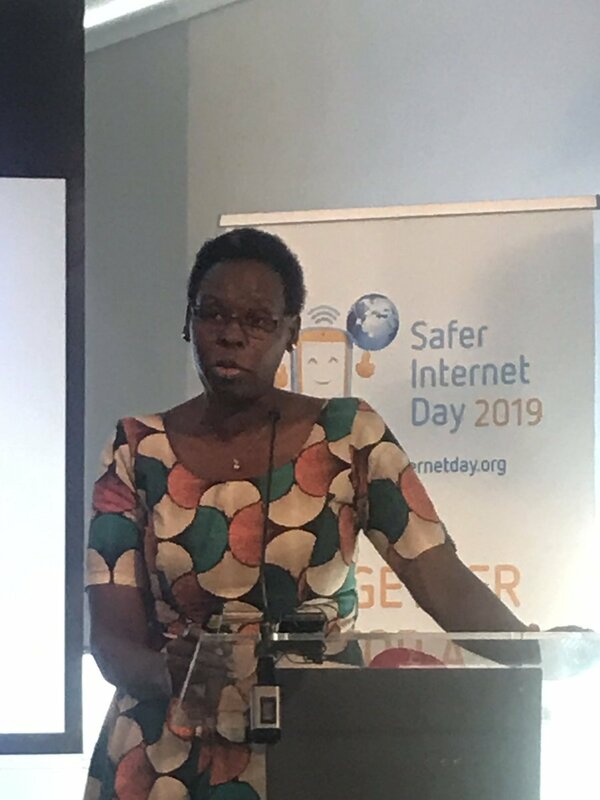 BUGOLOBI – Uganda Communications Commission (UCC) has Tuesday, February 5 hosted the annual Safer Internet Day to advocate for the responsible use of the internet at an event held at its Bugolobi-based head offices. The event that aims to promote safer and more responsible use of online technology and mobile phones, especially among children and young people across the world is themed: Together for a better Internet. UCC executive director Mr. Godfrey Mutabazi called for concerted action to tackle and prevent violence against children and young people online in Uganda where the internet population has witnessed 800 times growth since 1998. “People are demanding easy laws but we need strict laws in order to have a safer internet experience for everyone,” he said warning of the dangers posed by online violence, cyberbullying and digital harassment for the children online. Mr. Mutabazi stressed that the technologies of today have brought more dangers and that the exposure to children accessing such content is terrible. “We expect huge volumes of data to flow all the time and it will be accessed by anybody and everybody especially if we have wearable internet. The danger is real, in 5 years’ time in our own country, 50% will have access to the internet,” he said. The call came after a recent concern of young people and suggestions from a series of student-led #ENDviolence Youth Talks held around the world. Key among other solutions include toll-free line (0800 222777) for consumers to report any form of abuse. Stella Ayo-Odongo, the Executive Director of the Uganda Child Rights NGO Network (UCRNN), said the children and young people are the biggest users of the internet and are most affected; saying the open access to the internet has made children become passive recipients of inappropriate information. “The biggest risk we have is online child sexual abuse, children are recruited and lured by some adults who impersonate as fellow children to develop a habit of producing and sharing inappropriate information,” he said. She encouraged the public to create awareness of the dangers of the internet emphasizing that there is a need to go back to the basics including the role of the community in raising a child. Abdul Salam Waiswa; the head of the Legal team at UCC, said that the internet has also brought with it FAKE News since everybody can be a journalist. “Internet wasn’t created to bring us problems. It is supposed to make us happy and make our lives better but unfortunately we make it unsafe deriving misery from it,” he said. He said that Safer Internet Day shines a light on the most critical issues facing people today, protecting what matters to them in a hyper-connected world. “It is everyone’s responsibility to educate each other – we need to share knowledge and collaborate to protect ourselves against the current threats we face as people living in a connected world. “The outcomes are set to worsen, as criminals become more sophisticated and target every aspect of our lives from the connected home to our children’s toys, right through to our medical records and fitness trackers. Safer Internet Day 2019 has been celebrated globally with the slogan ‘Together for a safer internet. It is a global initiative aims to educate children about online safety and spark a border-less conversation about the responsible use of technology. The concept of Safer Internet Day Committees was introduced in 2009, to take the event truly global. Every year since then, the day had given parents the opportunity to help their children remain safe from the many dangers circling the Internet. Several activists around the world argue that Safer Internet Day presents a much-needed opportunity to spread awareness about the risks associated with the digital world, and empower both young and old to make the most of the internet while remaining safe. Attacks on Privacy: Stealing, or rather copying, a target’s personal information. This is how many cyber-attacks begin. Attacks on integrity: Also known by its common name, sabotage. Integrity attacks seek to corrupt, damage, or destroy information or systems, and the people who rely on them. Attacks on availability: Preventing a target from accessing their data is most frequently seen today in the form of ransomware and denial-of-service attacks. Ransomware encrypts a target’s data and demands a ransom to decrypt it. Cyberbullying: The use of electronic means like email, instant messaging, and social media to harass or stalk an individual or group. Offensive/Obscene Content: Websites that contain explicit, offensive, or distasteful content which may not be of the user’s liking. Cyberstalking: A crime in which the attacker persistently frightens or harasses a victim by using electronic means like instant messaging, email, or messages posted to discussion groups or websites. Online Predation: The act of exploiting vulnerable adolescents or children for abusive or sexual purposes. Sextortion: A type of exploitation where sexual images or information are used to extort money or sexual favors from the victim. Identity Theft: A crime where an imposter obtains key bits of personal information like your bank account details or Social Security numbers to impersonate you and commit fraud. Wi-Fi Eavesdropping: A method used by cybercriminals to virtually “listen in” on your Wi-Fi traffic and steal the data transmitted over the network. Spamming: The use of electronic messaging systems such as emails to send unwanted bulk messages (spam), which opens the door to phishing, malware, and threats to your privacy. Ransomware: A type of malware that locks down your computer or files and demands a ransom payment to unlock it.